Working on a research project for school? Check out Wikipedia. Want to know the marriage history of your favorite celebrity? Check out Wikipedia. Want the definition of an obscure term someone threw out in conversation? Wikipedia probably has an answer for that too. I get a lot of value out of the world’s largest, online encyclopedia, Wikipedia. But it wasn’t until my most recent social media class that I considered Wikipedia as having the capacity to serve as a reliable news source. One of the things that strikes me about episodic reporting on Wikipedia is the notion of how news that is aggregated by multiple sources has the ability to much more detailed and balanced. We live in a 24/7 news cycle culture, which someone might think leaves lots of room for thorough analysis and lots of detail. But that doesn’t seem to be the case. The average news story is reported in approximately 1,000 words, and as a result, more of the news we receive from traditional media outlets is extremely summarized. We see headlines running across giant marquee screens and the bottom of our television screens. But we don’t get deep dives into the details of a story. What I’m beginning to see is how the internet and tools like Wikipedia can change this dynamic. For the person wanting to dive deeper into today’s current events, the internet can serve as their best friend. An article published in the print version of The Washington Post can’t link to previous articles written on the same subject or provide background on the article’s central “characters.” But online news makes this possible. And the notion of turning to a Wikipedia page that represents the sum total of hundreds of perspectives is fascinating. My thought is that news delivered this way has the potential to even combat the growing trend of “the daily me” — a term coined by Nicholas Negroponte. The 7 July 2005 London bombings page seems to be a great example of this. And even pages on more trivial news events, like the Balloon Boy hoax of last year, provide a tremendous amount of detail. With the number of people on Wikipedia who care about accuracy and real truth, versus just “truthiness,” I think we can all benefit from news recorded on Wikipedia. I recently read Amina’s post titled “Personal Blog #6: Paths,” and thought that the questions she posed about choosing a path in life are likely ones experienced by a lot of people. In her post, Amina mentioned that she’s 24, and I can remember having a lot of those same questions at that age. I’m honestly just a few years older than her, but maybe a few years makes a really big difference in finding your path. Or maybe, it’s not so much that you find your path in your late-20’s, but that even if you haven’t found your path, you become more comfortable with the uncertainty. It seems like Amina is experiencing the typical feelings and thoughts associated with the quarter-life crisis — a term that some people consider ridiculous. But honestly, who says that only people in their mid-40’s can go through some type of personal crisis that causes them to evaluate where they are in life and where they’re going. I believe the quarter-life crisis is a real thing and that it makes complete sense. Around the age of 23-30, people tend to have a few years of full-time work experience under their belt, and they realize that it isn’t exactly as glamorous as they might have hoped. Today’s generation (or Generation Y) reflects on how its parents worked at the same company for decades, and that generates a serious fear. Who honestly wants to live a boring life, working a boring job? Recognize that the overwhelming majority of your peers feel the exact same way you do. Take comfort in knowing you are not alone. As you identify your different questions about your future, recognize that you don’t have to have all of the answers today. Know that even working in your dream job will come with some bad days. Perfection is a myth. Take time to enjoy the path that you’re on today. Even the worst job usually has some insight or lesson to offer. Be patient, and let the path develop. Growing up, I played my share of video games. There was Frogger on Atari, which I played at a neighbor’s house. Then there was my original Nintendo, which came with Super Mario Bros, Dunk Hunt, and the oh-so-awesome and coveted Power Pad (which really set me apart from my friends). There was Sonic and Columns on the Sega Genesis owned by my cousins. Mortal Kombat at the arcade. Tetris and Alleyway on my Gameboy. And Donkey Kong Country on Super Nintendo. And I guess I could say I’m still gaming today. I do own a Nintendo Wii and Wii Fit Board, although I must admit that both were purchased at the urging of my husband. (In fact, he delayed gratification in the months leading up to our wedding, and then rushed out to get the Wii Fit Board on the weekend after we got back from our honeymoon.) And I’m not too pleased that my Wii Fit age is 37. But even with all of the gaming that I’ve done, I hadn’t begun to scratch the surface of Massive Multiplayer Online games — commonly referred to as MMOs. The universe is so vast, and the associated profits are pretty impressive. What’s perhaps most fascinating to me is seeing the communities that are formed around the various games that exist. Playing a game can be pretty self-serving, but yet these games are bringing together groups of people in a sustainable and organic way — essentially forming communities. My laptop proved to not be in the best shape for entering Second Life, so I took some time to play a few of the Persuasive Games, like Windfall. It’s interesting how games are being used in ways to make us conscious about current events like energy production. However, I’d say that games aren’t always appropriate for every cause and product. 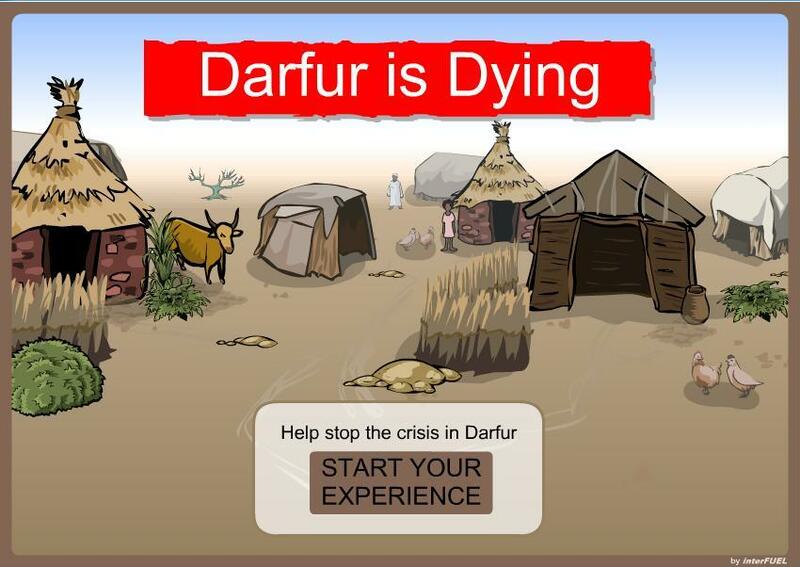 I work for Save Darfur Coalition, and MTV had a bit of a flop when they created a game for our movement. Call me crazy, but I think it’s hard to find fun in running away from a genocidal militia when it’s a trivialization of a very real experience. We appreciated MTV’s support, but we didn’t do a lot to promote it. Either way, gaming is clearly big business and here to stay. Finding ways to jump on the bag wagon should be on the mind of everyone working in social media. you know this whole notion of how society measures and labels time? b.c. and a.d.? before christ and anno domini (in the year of our lord). my life now comes with a similar structure. before july 30, 2009 and after. pre-Jarronn’s death and post. looking at calendars has taken on a whole new dimension. and everything else that’s dated, for that matter. emails in my inbox. receipts on my desk. canned food items in my cupboard. headings on a page of notes. if the date on something is before july 30, it usually causes me to pause. to remember how different life was then. how i thought of life so differently then. how i was a different person then. if the date is in the month of july 2009, my thoughts tend to turn to reflections on how quickly life can change. and to memories of my last everything with Jarronn. our last trip. our last movie. our last dinner. our last phone call. our last disagreement. our last kiss before he walked out the door to go for a ride with his friends. these dates define my experience. my understanding. my realities. (at least for now). they cause me to stare into space. as if staring long enough would take me right back to those days before july 30, 2009. days that i miss. those days were filled with lots of expectations and dreams. and yet, i know that those days were also filled with false securities. and sadly, those days weren’t meant to last. except in the form of receipts. and cards. stubs from the last movie we saw. photos. emails. memories. I’ll never forget my first major research project. It was 5th grade, and we’d learned all about using note cards to capture facts, how to organize facts into paragraphs, and how to create a bibliography page. Each student had to choose a difference U.S. state as the subject of their research paper. I chose Georgia — a choice that made great sense to me, because my 20-year-old brother was a Bulldog at the time, and I couldn’t have looked up to him more. In those days, the primary source for research was the traditional encyclopedia. The school library had a 1992 volume of Work Book encyclopedias for everyone to use. I, however, was one of the lucky students who had a set of encyclopedias at home — or so I thought. As it turned out, the set of encyclopedias I had at home were purchased for my older brother. Yeah, that same brother who was 10 years older than me. As a 10-year-old, I had little understanding of the fact that information about Georgia from 1984 was probably a whole lot different than information about the state in 1992. I learned there was quite a big difference when I got my paper back and was told that I had to re-write it. I made sure to use those 1992 World Books the second time around. In later years, the research process improved. Encarta was a tool that seemed to change my life! I can still remember logging onto Prodigy and popping my Encarta CD-Rom discs into the computer. The ability to type in a search term and generate an entry (most of the time) was incredible. But today, Encarta, a Microsoft product, has been discontinued. And what do you know? Shutting down Encarta was directly related to the growth of this thing called Wikipedia. But in the past, there have been questions about whether or not Wikipedia is better than traditional encyclopedias that are written by trusted sources. And anyone who has used Wikipedia on multiple occasions can attest to the range in quality that one might find from entry to entry. Yes, Wikipedia has its shortcomings. But ultimately, its benefits outweigh those flaws. And those benefits ultimately make Wikipedia better than traditional encyclopedias. Wikipedia is available to anyone with internet access. It isn’t limited by a finite number of printed pages like a traditional encyclopedia, so it’s able to contain millions of entries, as opposed to just tens of thousands. And as Clay Shirky describes in his book, Here Comes Everybody, Wikipedia allows users to self-organize in such a way that brings real value. Yes, there are times when people “vandalize” an article on Wikipedia, but within the network of users, there are enough concerned individuals who will correct those mistakes. And finally, there’s the speed. Learning about Georgia today is vastly different from the days when I depended on a set of encyclopedias from the past decade. And as I think back on that experience, all I can think is that that’s a very good thing. WEEKLY #5: Scared of the Google Empire? At a recent dinner party, where conversation had turned to current events, one person at the table made a comment that in today’s world, there are two things to fear. The first is Google, because of the amount of information they control, and the second is Oprah, because that lady gets presidents elected. Google’s dominance in the digital world is pretty undeniable. 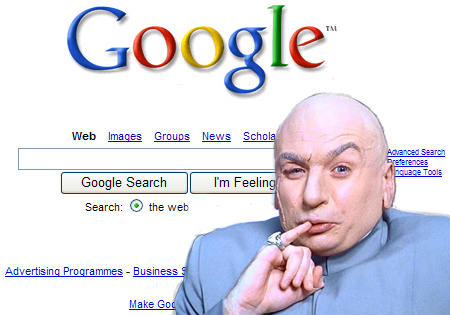 It’s impressive to see how many Google products exist and to see how people use the company’s name as a synonym for the verb “search.” It seems as though this dominance has quite a few people nervous about what the company is capable of — and even fearing that all of this power could be used in manipulative and controlling ways. According to December 2009 data, Google controls 66 percent of search market share. (Imagine if that figure was 66.6 percent…then we’d really know Google was evil). Clearly Google’s competitors have quite an uphill battle in trying to eat away at Google’s goliath share. And so from a market competition/anti-trust perspective, perhaps we need to be concerned about Google. But otherwise, I say Google should keep the super algorithm going. In fact, I already professed my love for Google in a previous post. And that’s because, like so many other people, I really find tremendous value in the things Google creates and facilitates. It’s Google’s effectiveness that has made the search engine so popular. And it’s also been their ability to understand, and even anticipate, the needs of users. In my mind, one of the best examples of their innovative nature is the company’s use of Google Labs. I won’t deny the natural fear that arises from knowing that Google possesses so much information. However, much of this data is only used in the form of aggregated, non-personal information (Greg Housh). There are also examples of how our information has been used to create better products. As these better products become available, I can’t help but to like Google even more. Somehow and some way, I became the friend that people call when they’re looking for restaurant suggestions in D.C. I’m not really sure how that happened. I hardly consider myself an expert. But yet, without fail, I get calls and IMs from friends looking for a particular cuisine, a place in a particular neighborhood, or my take on a place they’re about to visit. I feel like I’ve hardly scratched the surface of what D.C. has to offer in terms of restaurants and other fun activities, but apparently the amount of trying I’ve done has been enough to make me a resource to my friends. What can I say? I like to eat! And I really like to try new restaurants. But what most of my friends don’t realize about my “expertise” is that so much of it comes from using the Internet. I constantly use the Web to learn about new places to visit. I receive Zagat Buzz emails in my inbox every Thursday, with spotlights on new and popular restaurants. I read The Washington Post’s Going Out Gurus (GOG’s) weekly web chat to see what recommendations they make to fellow DMVers about the perfect spot for every occasion. And then there’s also The Post’s food critic Tom Sietsema’s reviews and annual dining guides. What I realized in doing my research this week, is that there are lots of other resources and communities I can tap into as I search for my next great meal. Not only are there a ton of sites that have created manageable lists of great restaurants to try, what’s great is that a lot of these lists are built using survey data and feedback from actual diners (like Washingtonian‘s list of the area’s best 100 restaurants). To me, this is one of the best parts of the Web. It facilitates conversations that were much harder to hold in the past. Where can you get the best Thai food in D.C.? Many would argue it’s at a small hole-in-the-wall called Thai X-ing. It’s on Florida Ave, and it’s literally a man cooking authentic Thai cuisine in a basement apartment. The place has just a couple tables inside, and people will call 2.5 hours in advance for take-out. In fact, the Thai X-ing Web site even suggests that you place your order one FULL day in advance. How did I find out about Thai X-ing? Online, of course. And it was the reviews from past customers that solidified in my mind that I had to visit. This is one of the effects discussed in Chris Anderson’s book, The Long Tail. Little known songs, books, movies, and Thai restaurants can become sensations, because of the Internet. We get to learn about so many new and interesting places, as opposed to just the places with the largest retail space or biggest marketing budget for their store opening. We get to deviate from the mainstream. Urban Spoon – you can type in a neighborhood, cuisine, and price range for a suggested restaurant. Yelp – online reviews and conversations about d.c. restaurants. Adams Morgan Now – this site is an all-around site for the area, but I love it. Plus, I know the team that designed it. Epicurious’s D.C. Guide – also by Tom Sietsema, but a nice way to organize the info. What’s your favorite D.C. area restaurant?